Pollution control is the process of reducing or eliminating the release of pollutants (contaminants, usually human-made) into the environment. It is regulated by various environmental agencies that establish limits for the discharge of pollutants into the air, water, and land. A wide variety of devices and systems have been developed to control air and water pollution and solid wastes. Methods of air pollution control can be divided into two categories: the control of particulate (pronounced par-TIK-you-let) emissions and the control of gaseous emissions. The term particulate refers to tiny particles of matter such as smoke, soot, and dust that are released during industrial, agricultural, or other activities. Gaseous emissions are industrial products such as sulfur dioxide, carbon monoxide, and oxides of nitrogen also released during various manufacturing operations. Particulate control. Methods for particulate control tend to operate on a common principle. The solid particles are separated from the gases in which they are contained by physical procedures such as passage through a settling chamber. A settling chamber is a long, wide pipe through which gases from a manufacturing process are allowed to flow. As these gases slow down in the pipe, the solid particles settle out. They can then be removed from the bottom of the pipe. A cyclone collector is another device for removing particulates from stack gases. The gases are fed into a rotating cylindrical container. Centrifugal forces (the forces that move things away from the center of rotation) send solid particles in the gas outward against the walls of the container. They collect there briefly, then fall to the bottom of the container. Gases from which the particles have been removed then escape from the top of the container. Gaseous emissions. Many different methods are available for removing unwanted gases, most of which are acidic. 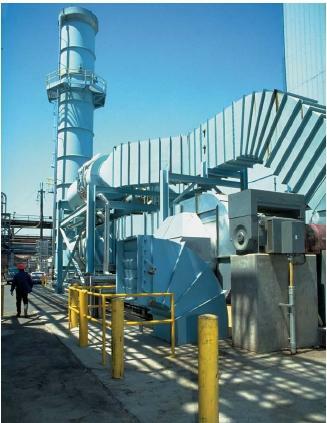 Scrubbers are smokestack devices that contain a moist chemical such as lime, magnesium oxide, or sodium hydroxide. When gases escape from a factory and pass through a scrubber, they react with the moist chemical and are neutralized. From time to time, the scrubbers are removed from the smokestack, cleaned, and replaced. Another method for controlling gaseous emissions is by adsorption. Activated charcoal is charcoal that has been ground into a very fine powder. In this form, charcoal has the ability to adsorb, or adhere to, other chemicals. When unwanted gases flow over activated charcoal on the inside of a smokestack, they are adsorbed on the charcoal. As with scrubbers, the charcoal is removed from time to time, and a new lining of charcoal is installed in the smokestack. Chemical reactions can be used to remove pollutants from water. For example, the addition of alum (potassium aluminum sulfate) and lime (calcium hydroxide) to water results in the formation of a thick, sticky precipitate. When the precipitate begins to settle out, it traps and carries with it solid particles, dead bacteria, and other components of polluted water. Biological agents can also be used to remove pollutants from water. Aerobic bacteria (those that need oxygen to survive) and anaerobic bacteria (those that do not require oxygen) attack certain chemicals in polluted water and convert them to a harmless form. Solid pollutants consist of garbage, sewage sludge, paper, plastics, and many other forms of waste materials. One method of dealing with solid pollutants is simply to bury them in dumps or landfills. Another approach is to compost them, a process in which microorganisms turn certain types of pollutants into useful fertilizers. Finally, solid pollutants can also be incinerated (burned). While artificial chemicals have improved the quality of life around the world, they have also posed a threat to the health of people and wildlife. In late 2000, in an effort to control the effect of toxic global pollutants, the United Nations Environment Program organized a meeting to draft a treaty to restrict the production and use of twelve persistent organic pollutants (POPs), especially those used as pesticides. The twelve toxic chemicals cited, which environmentalists have called the "dirty dozen," include eight pesticides (aldrin, chlordane, DDT, dieldrin, endrin, heptachlor, mirex, and toxaphene), two types of industrial chemicals (hexachlorobenzene and polychlorinated biphenyls or PCBs), and two types of industrial byproducts (dioxins and furans). These toxic pollutants were chosen not because they are the most dangerous, but because they are the most widely studied. Since it is still widely used in Africa to control malaria, DDT was given a special exemption: it can be used in those countries until replacement chemicals or strategies can be developed and put into place. One hundred and twenty-two nations (including the United States) agreed to the treaty. Before it can take effect, however, at least fifty of those nations must also ratify it. The cost of cleaning up tens of thousands of toxic sites on factory grounds, farms, and military installations is staggering. In the United States, that amount may soon exceed $700 billion. So far, the main approach has been to dig the polluting chemicals out of the ground and transport them to a landfill. However, after a decade of research, scientists in the early twenty-first century found that hundreds of species of plants, along with the fungi and bacteria that inhabit the ecosystem around their roots, seek out and often break down chemical molecules that can harm most other life. For example, there are sunflowers that capture uranium, ferns that thrive on arsenic, clovers that eat oil, and poplar trees that destroy dry-cleaning solvents. Research into using plants as pollution sponges must continue, but early reports of their helping to clean up pollution were promising. How to remove dead bacteria from UV based water purifiers ? please see the attached pollution cotrl articles. This is the nic earticle on pollution cotrol . it will help you to make a project. how do we control air pollution? what are the ways to purify them? HOW TO CONTROL AIR POLLUTION BY ACTIVATED CHARCOAL? Is there a method for larage construction sites to reduce the anount of airbourne contantinats? How many water parameters can be detected by analysing electrical conductivity method. plz send me project report on a source of wild water reserviour pollution. I believe if we all wake up to tackle d challenge of pollution we would have a safer environment,moreso most of the so called pollutants can be converted into something useful and less contaminant than the parent pollutant if the fate of science is really given better workable approache by the developing nation because the scientific idea is avalaible but no means of utility thanks. kindly help me for my term paper. My topic is all about water pollution... Introduction, body of the topic, suggestion, recommendation and conclution of water pollution? It was quiet informative. If the methods to separate the components of smoke, water and solid had been given in detail then it would be more attractive. Thanks for this important information.i would like to do project in waste water treatment ,in what ways waste water can be treat by biological method? Thank you for this. pls I also want to know more about phytoremediation. please i want to know HOW TO CONTROL AIR POLLUTION BY ACTIVATED CHARCOAL? i am an environmental engineering student. what are the maximum "tolerable"concentration of pollutants in air,water,and land. how can the issue environmental pollution be best handled? educate me!. I love dis. I wil like to know the roles of engineers in combating Environmental pollution. we own a strawberry farm and there is a field, right next to us, that the neighbor rents out and they have sprayed before.Last year we lost almost everything. How do we get something that will moniter if their spray is coming across the fence and wiping us out. who do we contact for this? Am writing a project on the effects of water pollution on pupils school attendance. Pls help me with the methods of teaching water pollution or the methodology. Am a Natural Resource Economist student, i would like to the pollution control method that are applicable in Uganda as a developing country. In addition to that i would also like to do a waste water treatment project, in what biological ways can it be done?